The leaves are changing and falling, as well as the acorns falling, although they've slowed down. 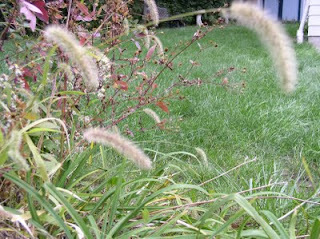 The neglected garden has a few interesting plants, not what I chose, but interesting. The soup pot is in use again. Today I made one of my favorites Pumpkin soup by LynnH. Pumpkin, applesauce and peanut butter. Quick and yummy. Speaking of interesting, a customer called my dressmaking shop and asked if i could shrink a dress for her sister. It seems the sister had undergone weight loss surgery, loved the dress and couldn't wear it any more. There's always a problem when shrinking dresses because you can't shrink the neckline. This dress was basically strapless, with a halter tie at the neck. The bodice was pieced and darted strangely, but I had enough fabric to work with and the design lent itself to downsizing. I keep forgetting that I have an old camera at work, so no before picture. I removed the bodice from the skirt and took out 12 inches, some on either side of the front ruffle and the rest at the sides and back. 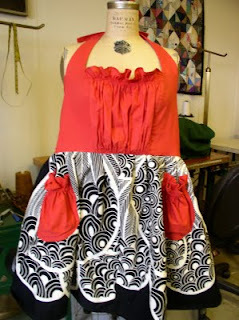 The ruffle piece was kept ans is and regathered to fit the new size. Four inches were removed from the waist (she must still have a tummy).The skirt was shortened 4 inches from the top, so I had to move the pockets. I hope it fits, but it matches the measurements I was given. I made some purple socks for granddaughter AE. She's a short adult with a size 2 shoe. She loves the socks. I love them too and want to sell the pattern, so only a sneak peek. 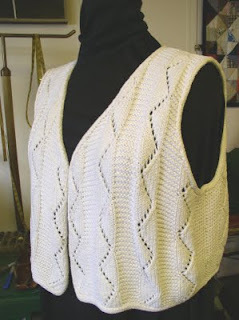 The white vest is quite old (1996), but I love it and wear it often. 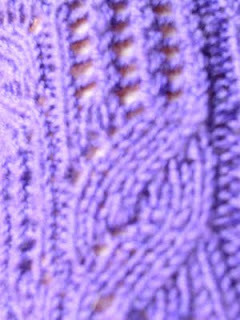 I designed it and dug it our of my archives to put for sale on Ravelry. A web site where I can sell patterns is still on my to do list. I called it ZigZag Vest. It knit from worsted weight cotton. I needed new photos for the pattern. 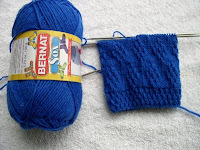 There are more grandchildren socks in the works. 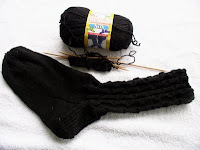 Black socks for a July birthday grandson. I sent an IOU in his card. I also have a pair for a granddaughter with an Oct. birthday. I'll see her Nov. 1, so not much time. Knit faster! I dream about quitting work, but I own the business and I'd have to bring too much stuff home. I have no place here to put it right now. Guess I'll keep juggling sewing and knitting for a while longer. I had a reading problem.